We are a family of dreadheads; all but one of us wears dreadlocks. That should not be a big deal, but it usually is. We get stares and questions wherever we go; we’re confused until we remember: oh, it’s my dreadlocks. But I remember a day when he was in early elementary when he did care. Just like my daughter, that seems to be the age of discovery, I Am Different. I was at the exercise gym when my husband called, “While dropping Elijah at school he started crying and I don’t know why; I am bringing him to you.” Outside of the gym it only took awhile for me to figure out the cause of his tears – his hair. He had decided that he wanted to dreadlock his hair like us and I had twisted his hair the night before. But when he got to school, the teacher made a remark about his “new hairstyle” and that was it, he wanted the twists out. I patiently unraveled his twists and his father took him back to school. But he didn’t want to cut his hair either. So he wore his hair in corn rows for two years after that, letting it grow and grow until he was finally ready to dread. 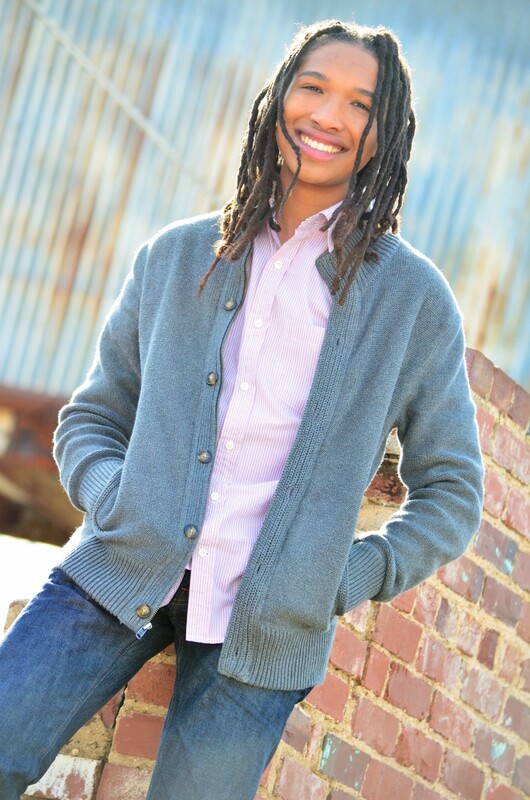 Now a college freshman, my son has worn dreadlocks for several years. He Is Different and he likes it. Just the other day, while cleaning our home office, I found this essay, written his junior year of high school. 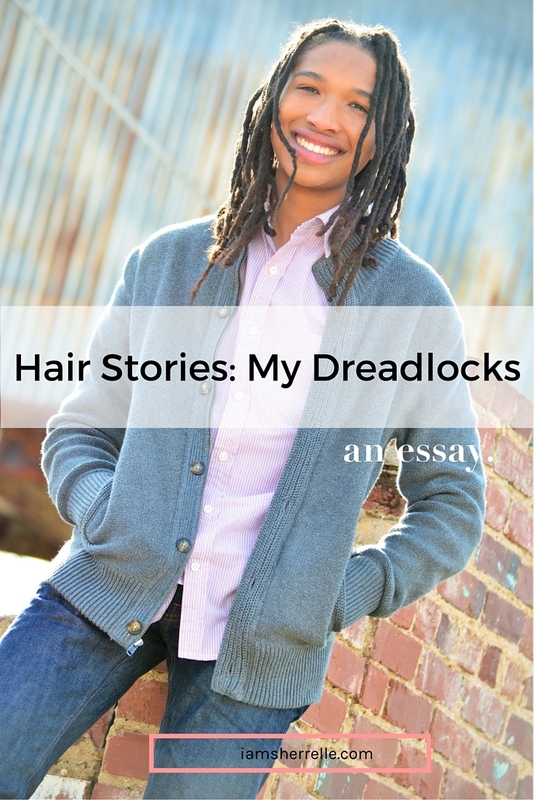 His writing brilliantly and poetically captures his personal dreadlocked journey. Wiping away the tears, I took a look in the mirror. Thick shoots were on my scalp where a full head of hair was just a few hours ago. The procedure had been painful and was made worse by the movie that was playing, Home on the Range, among the worst that Disney has produced. But it was finished, the years of growing my hair out in cornrows, the years of having my head neat and constrained, the years of being called a girl because of my hair and my resemblance to my mother, all done (Or so I thought. To this day, the girl comments still haven’t ceased.) It took four or so hours of excruciating tugging, twisting, and pulling at my scalp, the narrative of my life’s yet untold story being woven on my head. I volunteered myself to become consecrated, to become a Nazarite. My hair wasn’t nearly as long as my parents’, but both my mother and Daisy, the woman who started the locks assured me that it would grow longer. What they neglected to tell me was that before they would grow long and thinner, my dreads would shirk back into thick matted sprouts. I was 9 years old at the time and it was just before I started 4th grade. I would be at a new school, Paideia, so only the people who attended the Paideia soccer and basketball camps and John Stubbs saw me with braids. Thus, my change of hairstyle wouldn’t really affect my relationship with my peers. Their first and lasting impression of me would be the kid with the dreadlocks. My hair is both a magnet for welcome attention (“Yes, I’ve been growing them out for seven years. Thank you for asking, hot bassoonist girl at orchestra camp.”), and unwanted jeering (“No, drunk guy on trailing us on Venice Beach, my family is not Rasta. It would be prudent to stop shouting about it because my father is very, very close to smashing your face in.”). Generally, I make friends easily in new situations because people automatically assume I’m cool because of my hair, and Paideia was no exception. After the initial novelty of my first year, people got a bit too comfortable with me. I never got taunted outright but I still felt ostracized in different ways. Unwanted petting of my hair, trying to put stuff in it, presumptuous questions, all were seemingly friendly and joking acts, but I could tell they were a subtle form of ridicule. Perhaps the person sticking a staple in one of my locks thought he was a unique, edgy comedian, but I did not find it amusing as a weekly occurrence from different sources. Of course these same Seinfelds must also come up with an endearing pet name for me. One can gauge the popularity of dreadlockéd stars of the time by my chronology of nicknames. For a time, I was known as Lil John, of “Get Low” fame. I didn’t mind it at first, because people liked it when I said “Yeauuuuhh” and “Okayyyy” I thought myself quite funny. Luckily, he faded out of popularity when I started tiring of it. Whenever there is a dearth of a current celebrity with hair like mine, people just call me Bob Marley, and revert back to Rasta and Jamaican comments. My biggest annoyance is when people assume my family is Rastafarian because we all appear to have dreadlocks, even though my sister technically has twists. A few years ago, I was Lil Wayne, who I bear no resemblance to. Our locks don’t even look similar, and our faces and skin tones are not even close. People don’t seem to look past my hair and their alien fascination with it gets old, quickly. I feel a certain solidarity with long-haired males. We’re not straight-laced and square; we break the rules. Long-haired guys are free from the ritualistic castration that is the haircut. We are strong and sure of our bold choices with our head. Of course, shaggy guys can also relate to the somewhat emasculating feeling of asking a girl for a hairband, of sometimes having to settle for a pink sparkly one, or even a scrunchie. (Luckily the separation and length of my dreadlocks lets me tie my hair with two dreads in the back.) We know how it hurts to get it caught in jacket zippers. We can bond over being mistaken for female. A dermatologist once repeatedly referred me to as a she when I was eleven. I guess my Carmelo Anthony jersey, masculine name, and medical file that he was reading was not enough to make him see past shoulder length hair. This sense of solidarity may just be unique to me, and it is ridiculous to assume that all long-haired guys are cool. But that still doesn’t help me feel betrayed when my hairy brothers cut their tresses. It is a sad rite of passage when a (usually white) guy cuts off the hair he’s worn for most of his youth to get a more “mature” look. As time went on, I rapidly lost people I could connect with on that level. Eli Gershon used to have long blonde hair that ran down his back and gave him the appearance of a childish Norse god. Ciaran Buckley did all types of gymnastic spins and flips on the play ground, the swish of his mop trailing behind each of his twirls. August Bair had shoulder length hair that would swish lightly as he swayed with his guitar. I was the Winthrop to his Harold Hill and it our hair was something that united us, bridging the seemingly insurmountable gap between seventh and eighth grader. Tragically, Jane forced him to cut it. August’s mom came in and pleaded with Jane for an alternative. I overheard their muted conversation by sticking close by while I was on cleanup duty after rehearsal. “August could put it in a ponytail,” she suggested, but Jane would have none of it. Her noble period piece would not be tarnished by a parent’s unreasonable whims. “Then why doesn’t he have to cut his hair?” Mrs. Bair said with an accusatory tone and a finger pointed at me. Jane stammered out an incomprehensible defense about how children could possibly wear their hair long in that time. I think she was afraid that I wore my hair in dreadlocks for religious purposes and she also could sense that she was nearing the logical wormhole that is the existence of a blonde family in 1912 Iowa that bore a black son (An awkwardness that did not end with The Music Man; I was also the very visible brown spot in the Alpine-white Von Trapp family). His mother’s appeals against Jane were fruitless, something she perhaps knew before coming in. August came back after a long weekend with his hair shorn and I had no one. I dunk my head under the water of my grandparents’ pool for some respite from the swollen July heat. I let my body sink down to fully submerge. My hair, however, stays above the surface trailing me like tentacles from jellyfish. It lingers for the briefest, gentlest moment in Marrietta that day. It lingers like a ghost, as if to remind the world of my presence. Eventually, the water penetrates the porous dreads and they start the gentle descent to my shoulders, so slowly that it’s not clear that they actually moving downward at all. The message still remains: The world will know my story, because my story is in plain sight, blossoming from my scalp. My hair is my strength, channeling the life force of my shaggy forebears who were brave enough to wear their hair like me. I am Kurt Cobain, I am Milli Vanilli, I am Captain Hook, I am Troy Polamalu. I am a Beatle, I am George Clinton, I am David Cassidy. I am Zeus, I am Rick James, I am Jaco Pastorious. I am Crazy Horse, I am General Custer, I am Samson. I am Bob Marley. We have the confidence to make bold decisions to rewrite history. We are blessed with the ancient burden of being an irregularity, a beacon of excellence in a world of conformity and mediocrity. P.S. He got an A. Read the first installment of Hair Stories: Teaching My Daughter To Love Our Natural Hair.